Green Fairy Quilts: AccuQuilt GO! Review. I have had the last couple of days to try out the AccuQuilt GO! and now I can let y'all know how I feel about it. The Ready. Set. GO! Ultimate Fabric Cutting System starter kit comes with the following: GO! Fabric Cutter, GO! 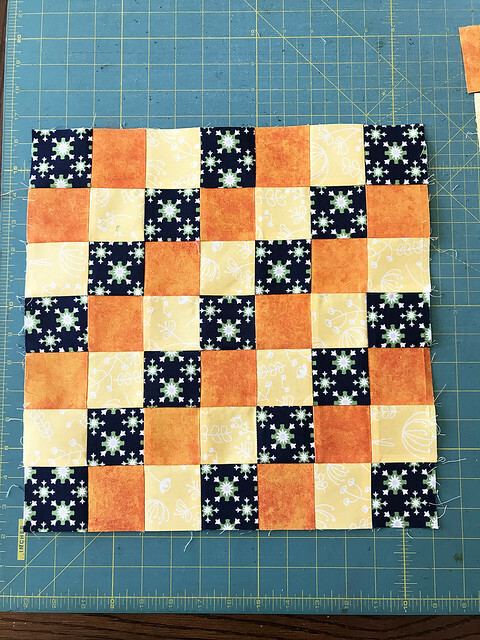 Qube 8" Mix & Match Block, GO! Strip Cutter - 2 1/2" (2" Finished), GO! Cutting Mats: 6" x 6" and 10" x 24", GO! Qube Book by Eleanor Burns, with Die Pick and Over 70 free patterns. This arrived in a beautiful box and is wrapped nicely, the packaging is so inviting - makes you want to create right away. Most of the cuts that come in this starter kit are the sizes I use on a regular basis for my designs. I wanted to compare whether this would be something that was helpful or something that is just a different way to do things. 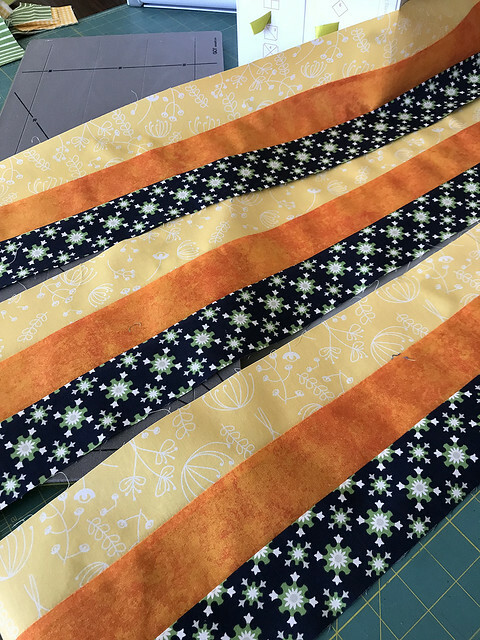 The first thing I tried out was the Strip Cutter - this will cut up to 6 layers of fabric and will make the strips 2 1/2" x 44" or 2" finished - it's like having the tool to make your own jelly rolls. I picked out 3 different fabrics and set them on top of each other and loaded the AccuQuilt GO! and rolled the strips through. 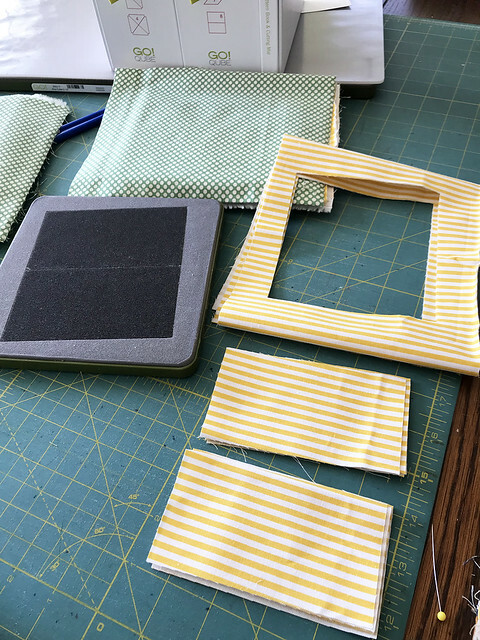 I loved being able to have a perfectly straight cut for each strip and I was able to cut 3 different fabrics folded at the same time. After that I sewed the strips together in 3 groups, then sewed those strip sections together. Once the strips were ironed I cut them out vertically to create strips of 2 inch squares. I didn't dare use the strip cutter on this part, because I wanted to make sure I could see the seams to make sure the cut was straight, so I ended up using my rotary cutter and straight ruler for that step. After that, I sewed all the strips end to end. You get 17 cuts from a 44 inch strip, so you end up with a really long strip sewn together. After that I unpicked the seams at each 7 squares and created the following block. 7 strips create one 14 1/2" block and with the accuracy of the GO! - the blocks were exactly the size I needed them to be. Here it is all sewn together in a block. 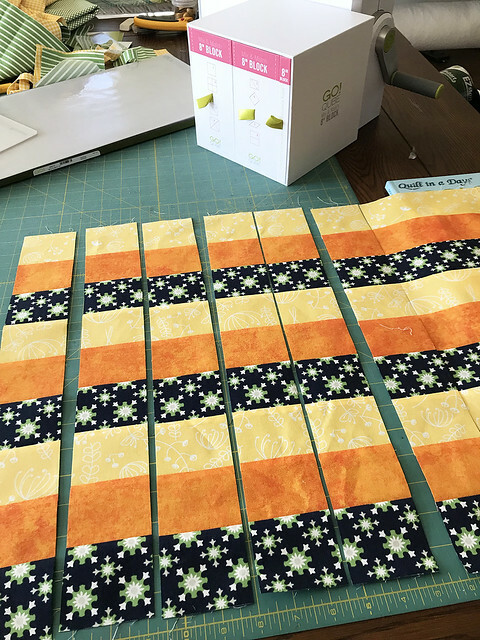 From these strips, equaling about 1/4 yard of 3 different fabrics, I can get 3 blocks at 14 1/2" - if you just triple that, using 1 yard each - you could get 9 blocks finished. Add a large sashing and you have a perfect quilt top. So, I would use the strip cutter again - I liked being able to cut more than 2 fabrics at once, which is what I normally do. However, I would use my other rulers and rotary cutter with it as well. So, this is a great way to make sure those strips are just the right size, but it doesn't replace all my tools. 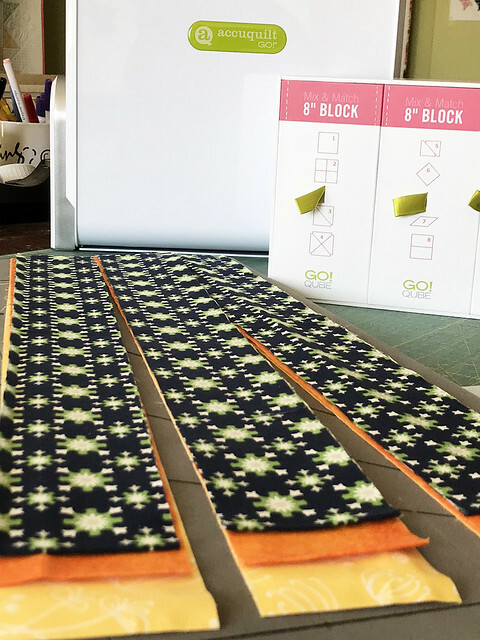 The other cuts in the Qube block are fun to use as well - up to 6 layers without a problem. The only thing is - you have a bit of waste. I could have cut the fabric down, so there wasn't as much waste, but then I might as well just cut it myself. The above cut is the 4 1/2" x 2 1/2" rectangle die, I use this size a lot. So, it is fun to get 12 cuts in one run. The other cut I used is 4 1/2" for a 4" finished square. Again, I loved being able to cut 6 layers at a time. 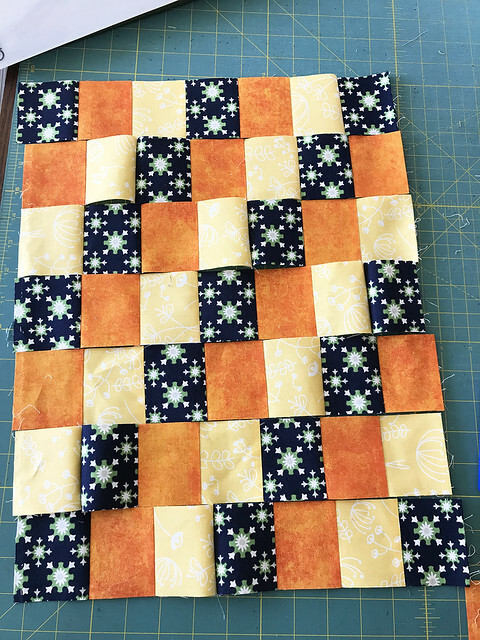 I really like the idea of the 2 1/2" square - you can get 4 squares per cut, times that by 6 layers and you have 24 squares cut in one run. 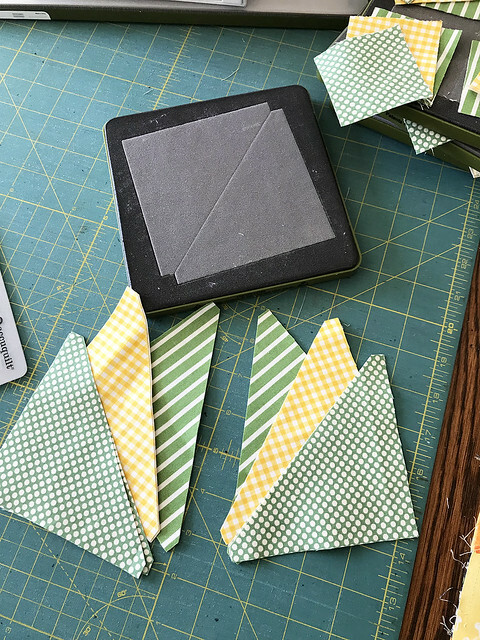 The half square triangle cut is great for those times when you don't use the square method or only have a few half square triangles to do in a project. Okay, I have thought a lot about what this tool could do for me. As far as the square cuts that come with the 8" Qube starter kit - I would only use the AccuQuilt GO! 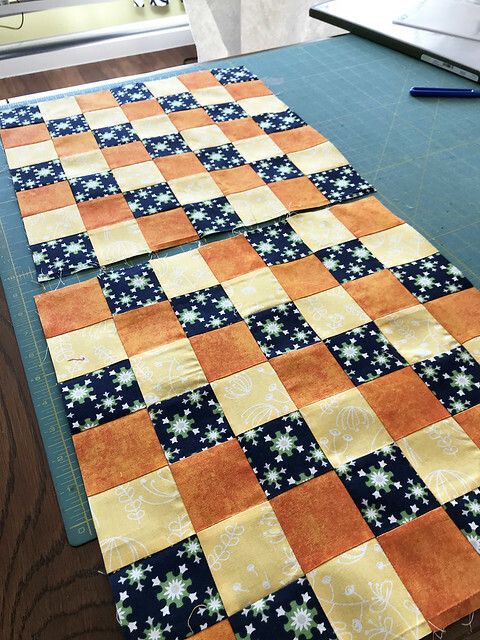 if I am making a scrappy quilt, like my Patchwork Christmas quilt, and if I am using precuts or my stash to sew a quilt top. The reason for this is because I would be able to cut off a small piece of fabric and use what I need and cut several fabrics all at once. So, scrappy quilt - yes, I would definitely use this again - in fact, I am looking forward to it. On the other hand, if I am using yardage - I might as well use my ruler and rotary cutter because I would be adding a step with the GO!. As far as the Strip Cutter - I love it and will definitely be using it again. 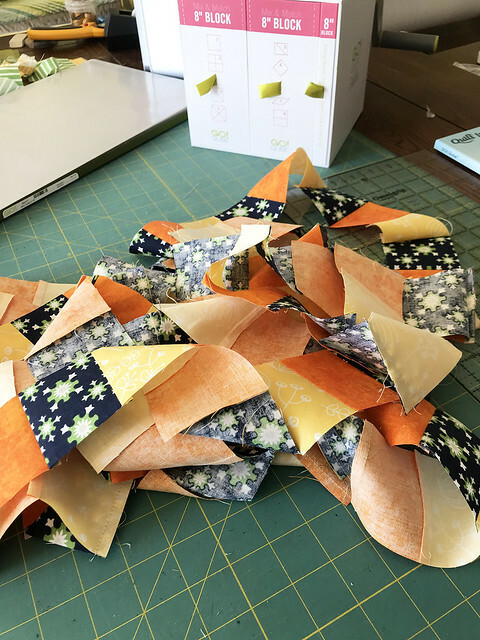 I love being able to have the strips be perfectly consistent with each cut - knowing they are accurate and ready for strip piecing. What I would love to use with this AccuQuilt GO! is the other templates - like the curved piecing or the geometric dies. There are a lot of options as far as those dies and I think I would have more fun with this GO! knowing that each one of those cuts is perfect - I know that would save me time and a lot of headache making curved designs or geometric designs. 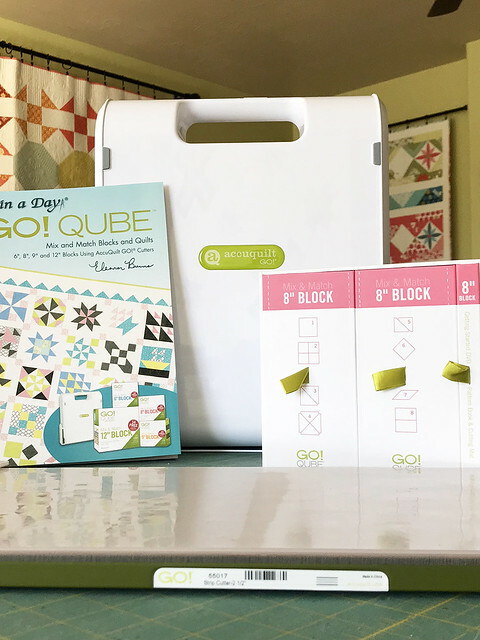 This system is great for kids or beginner quilters as well - I would feel comfortable letting my kids cut out fabric with the GO! and with all the amazing free patterns that come with the GO! they would have plenty of projects to make. I hope you'll give the GO! a chance and have fun making some amazing, accurate and beautiful quilt projects. I am happy to add this to my studio as a new and innovative tool. More amazing quilts to come! Thanks so much for the review. The GO has been on my wish list for quite a while but haven't been enticed enough.....yet. 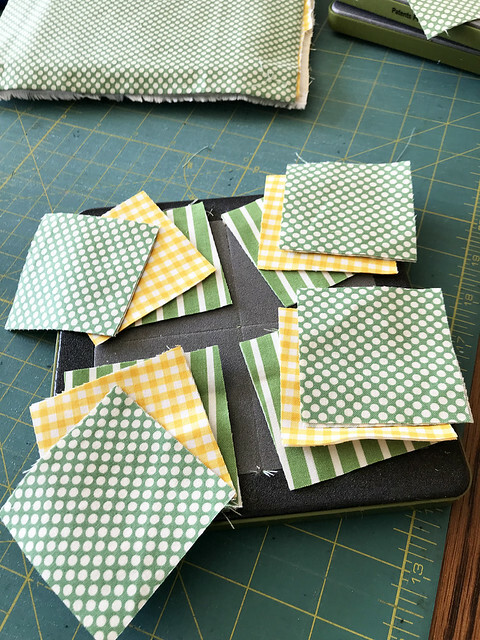 The strip, 2.5" and 5" dies would be ones frequently used (I'm really not a "piecer"....definitely an obsessed quilter!!!). I have the go, just bought the 2.5" strip die from a friend, I save money there, but I had to buy the mat, that was expensive, so I really need to cut those strips! 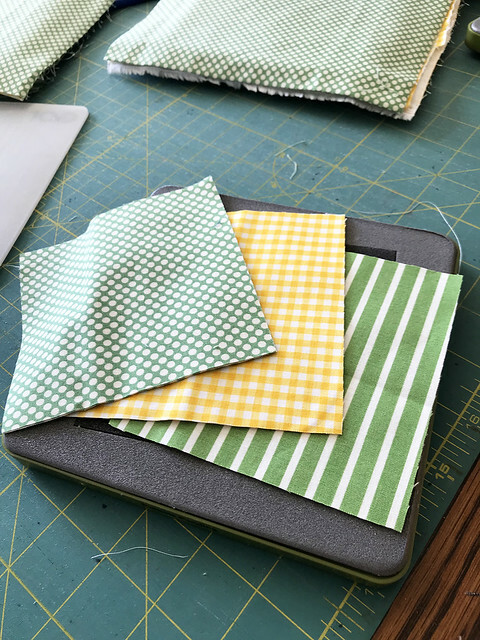 I love the 8" clamshell die - I have made quite a few quilts using it. I have used some of the square dies. I try and get friends to borrow or come over and use it so I feel like I have justified the cost. I have owned an Accuquilt Go Big for over a year and absolutely love it! I find that I now analyze patterns and figure out how to use my dies instead of a ruler. The accuracy can't be beat and eventually you will figure out how to have much less waste. Great review! Don’t know that I would afford myself the luxury, but it would be nice if one just suddenly appeared! Thanks for your honesty. I've seen people cross-cut the strips on Go by marking lines on the foam of the die, giving them something to line the strips on. I don't have one myself (yet) as I am quite handy with my rotary cutter and tools. Agreed! I bought a GO! Baby die cutter specifically for the clam shell die, which has little notches to help you not only cut the clam shells out perfectly, but also match them up perfectly for the curved piecing. I wish I had bought the regular GO! cutter instead of the Baby version, though, because the oversize 8" clam shell die is not compatible with the GO! Baby and that would be wonderful for showing off large scale modern prints. Drunkard's path and apple core dies are awesome, too -- SO much easier than trying to cut them out with any other method!